If you've been to a runway show recently, you know that they're not exactly like Style with Elsa Klensch anymore. Big-name bloggers proudly sit front row, their It bags spilling onto the catwalk, while scrums of photographers jockey for their photo and veteran fashion journalists scribble away from second row. Everyone watches through iPhone screens (guilty) and, after, crowds the runway flashing peace signs for #ootd photos. 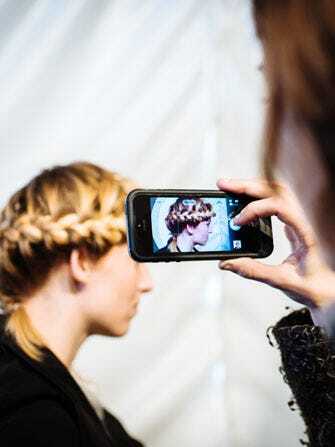 The days of sedate, salon-style presentations is long over, and even for runway shows that are meant to be loud, boisterous affairs, there's a certain amount of...let's say, decorum that's been missing from the audience ever since smartphone-wielding bloggers and writers started rubbing shoulders with the editrice elite. At least, that's what Robin Givhan asserts in her recent op-ed for The Cut. Her piece is primarily focused on the dilemma currently facing fashion blogging — namely, what happens when the blogging outsiders become real-deal, front-row insiders. While it's definitely worth a read, we couldn't help but be captivated by her descriptions of what runway shows were like just 10 years ago, before many of us started attending. So, let's climb in the wayback machine for a look at Fashion Week in the era B.S. (before smartphones), shall we? Until a decade ago, Givhan writes, there was a front-row etiquette that most runway-show attendees observed: "Do not lean forward. Keep your legs tucked neatly under your seat, your handbag out of camera range, and any papers discreetly in your lap. Maintain a poker face. And do not take pictures. Seriously." Sure, some attendees violated that unwritten rule. But, their penalty was swift and decisive. Givhan remembers Gladys Perint Palmer, former San Francisco Examiner fashion editor, taking photos at multiple shows — and, unlike those of us who take pics to burnish our social media reps with insider-y cred, Palmer was an accomplished illustrator who actually needed those pics to inspire her drawings. On multiple occasions, Givhan remembers being stunned "as security guards tackled [Palmer] when she pulled out her camera at a show." So...Why Is Topshop Calling This A "Ghetto" Shoe?